During my last year at Reed College in Portland, Oregon, my roommate Tamara and I were invited to have Thanksgiving with our friend Erik, his father and his step-mother. The food was incredible and a welcome change for the three of us students. Michael and Lorie were wonderful hosts and it was an evening full of excellent conversation and warmth. It was always sad to be unable to fly home for Thanksgiving, but the hospitality that I found in other homes and with new friends on those occasions is something that I will never forget. "When I was first making this recipe, I was ... doing subsistence farming in northern British Columbia. So they were made with Hubbard squash that we grew in our garden and with flour that we ground each morning as we waited for the cabin to heat up, and of course they were baked in a wood-burning stove." That sounds like such an inviting environment, especially as I am bracing myself for another dark, city winter. These rolls are delicious anywhere, but I bet they were particularly comforting when baked in a wood-burning oven. Thank you very much to Lorie for introducing me to these rolls and for providing me with the following recipe. In a saucepan scald the milk. Add the maple syrup, butter, salt, and squash, stirring to mix well. Let sit until lukewarm. In a large bowl dissolve the yeast in the warm water with the ½ teaspoon sugar or honey. 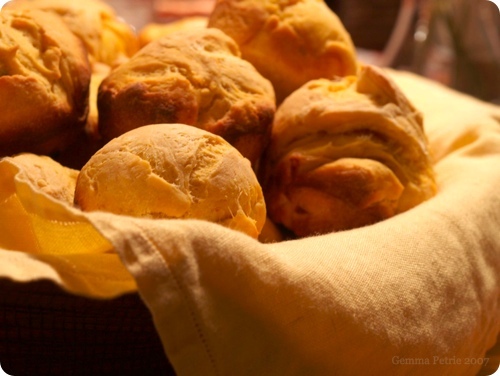 When it is bubbly, add the cooled milk-squash mixture, eggs, orange peel and 2 2/2 cups of the flour. Beat with an electric mixer 2 minutes or at least 200 strokes by hand. Gradually add enough more flour to make a dough that pulls away from the sides of the bowl and is stiff enough to knead. Turn the dough out onto a floured board and knead until smooth and elastic, sprinkling with a little more flour if it remains sticky. Put the dough into a buttered bowl, turn to coat all sides or brush the top with melted butter. Cover and let rise until doubled in bulk. Punch the dough down, turn out onto a floured board and knead a few times to press out air bubbles. Cut into pieces about the size of eggs, cover and let rest for 10 to 15 minutes. 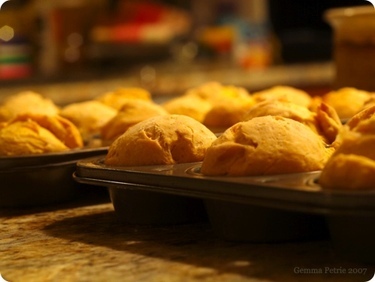 Form into rolls of whatever shape you wish (the easiest is to make balls and put in buttered muffin tins). Brush the tops with melted butter and let rise, lightly covered, until not quite double in size. Preheat the oven to 375 degrees F. Bake 15 minutes, or until done. Break one open to test. Do not over-bake. Serve hot, or, if you plan to save then until the next meal or freeze, bake for a slightly shorter time, cool on a rack and re-heat. They were really good rolls, beautiful. These look and sound delicious, Gemma. Also loved the warm, wonderful story. Sometimes when I read about such direct, in-touch-with-nature lives, I wish I could be a person who could do that. But mostly, the city boy in me subscribes to New Yorker Fran Liebowitz' view, which I will misquote here: "The out of doors is what one must pass through to get from one's apartment to a cab. And I even forgot to close the quote. Dang. Hi, those squash rolls look wonderful, I love the color! I'm also a fellow Chi town food blogger stopping by to say Hi!! those are just gorgeous. i want one!!! Those rolls look wonderful. I have some squash leftover from my CSA bag. I may have to try them. I'm a Chicago native and now live in Rochester, NY. Your blog makes me a little homesick.